Well we finally did it!!! 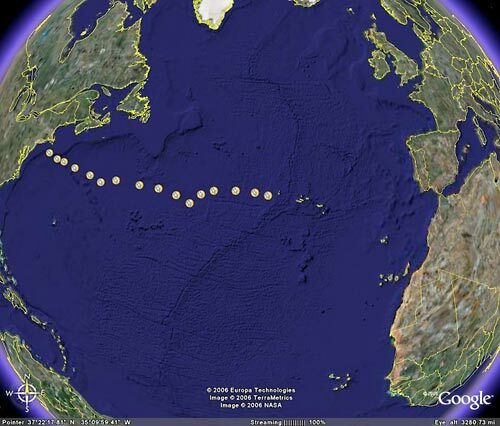 After years of dreaming and months of planning on May 30th, Marco and I left our mooring at Stanley’ Boat Yard in Barrington Rhode Island and headed east to the Azores. Well, not directly to the Azores, our first stop was to be at Block Island, RI where Katy, David and the children were waiting for us. We had many feelings running through our minds as we let go of the mooring ball at Stanley’s. We were anxious, excited, a little scared and most of all just ready to stop having to deal with all the prep work and get on with the show. The trip down Narragansett Bay was the time that I was able to pack away all of the fresh produce that I had bought that morning. The boat was already pretty much packed by this time except for these last few items (about 20 grocery bags) and the last few odds and ends from the house (another 50 or so boxes, tote bags etc…) By the time we reached our old stomping grounds at East Passage Yachting Center, I had most of the supplies stored away. Now if we can only remember where we put everything. 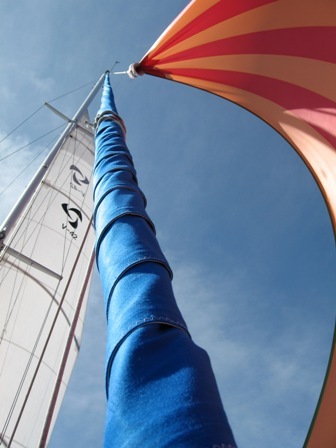 As we were sailing by EPYC we were so lucky to see Jenne and Carl sailing on Impulse. We yelled out goodbyes and then continued on our way. When we reached Newport, RI, we were thrilled to see that John and Judy had made a large banner that said, “Bon Voyage” and they were holding it up as we sailed past Fort Adams. It was such a great send off and it really made us even more excited to get the adventures going. Thanks again for that, you guys are the best!!!! 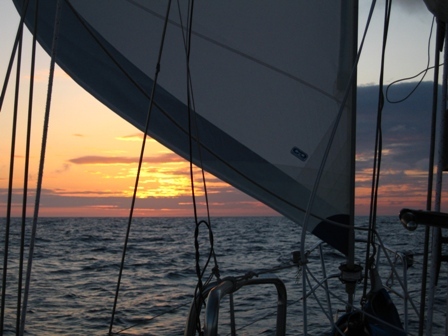 Our sail to Block Island was a great little shake down cruise and it proved that all systems were a go. That night David, Katy and her mom, Maureen, made a delicious dinner for us, and we talked and laughed a lot. We called it a pretty early night and Marco and I headed for Dalliance to spend our first of many nights aboard our beautiful boat. The next morning Isabel, Claire, Dave and Katy brought a cake and balloons to celebrate the big day. Afterwards we headed off to Paine’s boat yard to top off our diesel and water tanks for the last time until we reached the Azores, waving goodbye to the Dirks clan for the last time until January where we plan to hook up with them in Barbados. 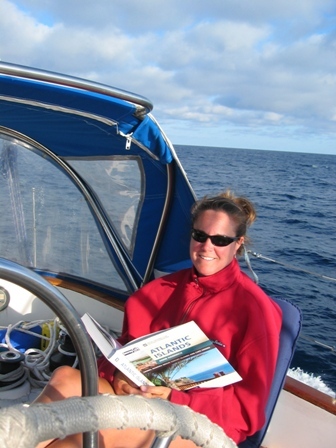 We had read somewhere in one of the many books and articles we had read over the last couple of years to help us prepare for an extended sailing voyage, that it is a good idea to wave your last goodbyes and when you reach an area where they can’t see you any longer to drop anchor and get your wits together. This is exactly what we did. We picked up a mooring and here we double and triple checked all the systems, removed all the lines and bumpers from the deck, and did a "cross check and all call". After a couple of hours we decided that we were ready to begin the most amazing adventure of our lives. At 3:30 p.m. we sailed out of Block Island harbor, called our families on our cell phones and waved goodbye to land, knowing we were not going to see it for at least another 17 days. That in itself was kind of a surreal feeling but exciting at the same time, knowing that the next piece of land that we would see would be the island of Flores, the first island west in the archipelago of the nine islands that make up the Azores. That night Marco was on his watch, from 8:00 p.m. until 1:00 a.m. and I take the 1:00 a.m. to 6:00 a.m. shift. I actually got the best deal because by the time we reached the longitude of 65° the sun was rising at 3:00 a.m. and I only had 2 hours of darkness during my watch. (I also refused to change the time on my watch so that this continued to be the case all the way to the Azores.) I was able to get amazing photos of the sun setting and rising. Anyway, to get back to the story, at around 11:30 p.m. Marco woke me to see the most amazing sight. There was a pod of about 30 Bottlenose Dolphins swimming in the wake off our bow. Now was this a send off or what? Already on our first night we were seeing first hand things we had only dreamed about before. At 3:30 p.m. Marco turns on the single side band radio and listens to Herb Hilgenberg out of Ontario, Canada, often referred to as South Bound II, on 12359kHZ. It is a call in show for offshore vessels, run by Herb, who prepares a detailed 5 day forecast for each yacht on his ‘log’. He gives advice about potential storm systems, wind patterns, fluctuating currents, gulf stream pattern, etc… and in return you are expected to report the current conditions at your position. 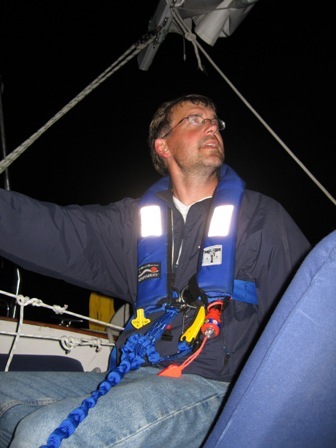 Despite repeated hailing, Marco has never been able to make contact himself but he was able to overhear other sailing vessels in our vicinity and what Herb forecasted for them. We have found this very helpful and entertaining at the same time. Herb often sounds impatient with the callers and God forbid you give an improper report of local conditions or miss a waypoint. I am sure many captains feel like they have just been sent to the principles office after having an exchange with Herb. After the radio program we sit down to dinner in the cockpit. Many people have asked what we are eating on board. I basically cook what I would normally cook at home. We have had roasted turkey breast with potato salad and lima beans, cashew chicken stir fry, tacos, pasta with pesto, etc… Having the freezer and fridge on board has been a blessing, not to mention the oven and stove, and I really enjoy making a nice meal at sea. One thing for sure is that we will not starve on board Dalliance. I will bring more fresh water when I restock next time however. I underestimated just how much we would actually drink during our days at sea. We have 2 -100 gallon tanks of fresh water but it tastes a little funky, even after I removed the inspection covers and sterilized the tanks before we left, so we primarily use it for dishes and showers and I use bottled water for cooking. Speaking of showers, that is another question we have frequently been asked, how do we shower? We have 2 heads with showers on board but to conserve water Marco and I have been going on deck to the bow where we have a salt water deck wash hooked up. There we wash and shampoo our hair (don’t worry moms we wear our harnesses) then afterwards go below deck to the head and rinse off with fresh water. It is amazing how warm the water is since we reached the Gulf Stream, it is at least 75° F and very comfortable to shower with. After dinner we sit back and watch the sun set and then Marco will usually go down for a quick nap so that he is bright eyed and bushy tailed for his watch at 8:00 p.m. Once he starts his watch I usually go down and get some shut eye myself. So this is the normal day to day activities we have established for our trek to the Azores. We are so surprised how fast the last 17 days have gone by. There has never been a moment that either of us has felt bored or ready to get off the boat. We both have really enjoyed these last couple of weeks at sea and feel very relaxed and refreshed. Now that I have described what our day to day activities are like, I will tell you about all the amazing wild life we have seen since the send off by the dolphins off the coast of RI. The second day at sea (N 39°51’.89 W069°25’.11) we were excited to see a large pod of Pilot whales off of our beam. Pilot whales are pelagic, and occur in high densities in the winter and spring over the continental slope, exactly where we encountered them. Then they move inshore and onto the shelf during the summer and autumn where they follow the movements of squid and mackerel populations. It is interesting that the Pilot Whale got its name from the belief, which is unproven and probably not true, that a single member of the pod pilots, or leads, the group and that the others continue to follow, even when it means certain death. It was so amazing to watch the pod and Marco was even able to video tape one of them spy-hopping. For those of you that don’t know, spy-hopping is when a whale raises its head vertically out of the water at least high enough for its eyes to be clear of the surface. The whale will often rotate slowly, apparently to scan the surrounding area visually. Unfortunately they did not get too close to us for a real good look but it was great fun anyway. This same day we were also blessed to see as many as four Ocean Sun Fish. They are such amazing fish. They actually are very flat shaped with an extremely small face and mouth and look very prehistoric. When it is sunny and calm seas are present, they like to tip themselves so that they look like a plate on the water and they use one fin to balance to sun themselves. We have seen a couple of them off Brenton Reef, Newport, and off the coast of Maine but I still always find myself in awe of them. They do not frighten easily and they have come up to our boat a few times to check us out also. That same evening the wind was coming out of the south-west at about 10-15 kts and a small bird landed in the cockpit of our boat and ended up staying with us until the sun rose the next morning. 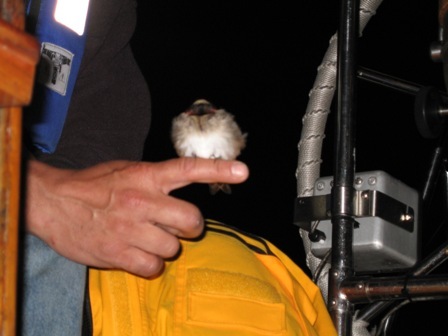 The little guy even rested on Marco’s finger for a while. When we spoke to our friend Judy, she told us that this is not that uncommon and that it happens often on lobster and fishing boats. We felt pretty special anyway and missed the little guy once he was rested and flew off. N 39°32’.9 W063°26’.2 and all of a sudden this little fish literally flew like a bullet over the waves with a few others following. It has been said that a few captains have sustained black eyes and tummy punches from these little guys, although I have to admit I never truly believed that they could cause any damage. But when you actually see the speed and height off the water they achieve it has made me a believer. The next coupe days and nights were quiet concerning wild life sightings until Tuesday, June 6th at N 38°54’. 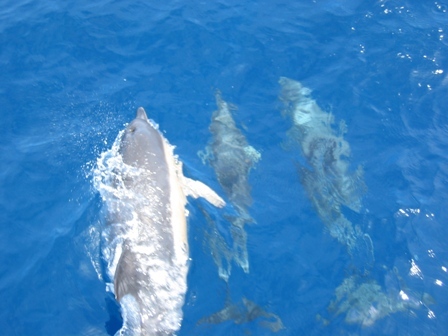 W045°50’ we got to see Bottlenose Dolphins jumping out of the water alongside the boat. As some of you may remember a Bottlenose dolphin was the star in the television series Flipper. It was amazing to watch, but little did we know that 3 days later at N 38°5’. W042°30’ we would be entertained 2 more times by the Bottlenose Dolphins as a pod of at least 20 swam around our boat and 3 stayed and played in the wake of the bow for almost an hour. It was truly amazing. The winds were calm and we could actually hear their clicks and high pitched calls under the water. They would also turn on their sides and swim while looking at Marco and I watching them. It was then that we realized that dolphin trainers are somewhat of a scam, as it seems that they already know all the tricks. That same evening after dinner (baked ham, twice baked potatoes and a cabbage salad) a pod of about 18 Bottlenose Dolphins came and played with us for about another hour until the sun went down. This pod actually had 2 very small baby dolphins in it and it was fascinating watching the baby and its mother interact and play together, truly spectacular!!!! It is also an amazing fact that I just recently read that calves are often not fully weaned until about 18-20 months of age and they usually stay with their mothers for several years afterwards. Some other interesting facts about the Bottlenose Dolphins are that their habitats occur in oceans and peripheral seas at tropical and temperate latitudes where they like water temperatures between 50 to 90°F (10-32°C). They also have coastal populations along the continents and around most oceanic islands and atolls. The Bottlenose Dolphins that are off the Atlantic coast migrate from north to south between New Jersey and North Carolina seasonally. They also have been known to reside in bays, estuaries and in some cases the lower ends of rivers. There is also a pelagic population that is centered off shore in the Gulf Stream of the North Atlantic and this is the group that we had the pleasure to meet. 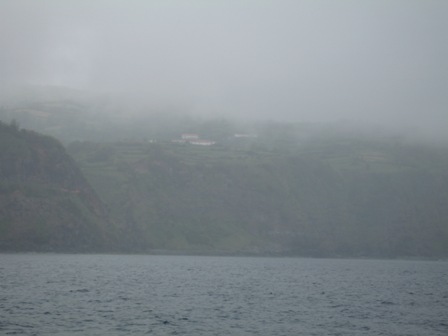 On Thursday, June 15, in foggy, drizzly conditions we finally made land fall on the island of Flores in Porto das Lajes.